What if you could offer your tween or teen a book that would help them get through the complexities of peer relationships? Perhaps a template, so to speak, on how to make your way around the school hallways without wondering if someone was snapping a photo or instantaneously uploading something you said in the cafeteria on to a social media site. AND… what to do IF you found yourself as online fodder for others. Also, what if this same book can help as a catalyst for discussion between parents and their children or teachers and their students? Worth the price of two vente lattes? 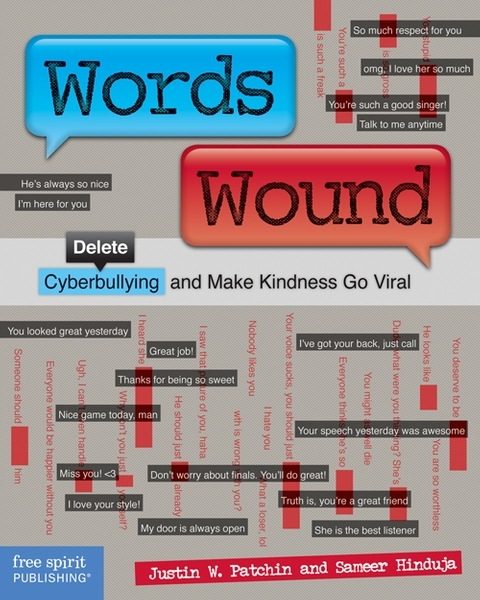 Online cyberbullying is a problem and one that is aptly addressed in WORDS WOUND by Justin Patchin and Sameer Hinduja. In less than 200 pages this paperback gives students skills to help prevent cyberbullying as well as how to react if they are ever a victim. The authors stress being proactive, but know that sometimes they can’t stop every problem – so what to do if a teen does find themselves in the midst of online bullying? Parents will read this book with perhaps some astonishment. As a Psychologist who works in social media, I had NO idea of some of the sites mentioned that teens are using that are a bit “off the grid”. I do now! Now my shoutout to teachers – this book should be on your shelf! It gives you ideas on how to prevent and stop cyberbullying. The insights shared are invaluable. The authors have included excellent talking points that are mature and thought provoking. Guidance counselors also should add this to their books on helping those bullied in schools and for peer group sessions. WORDS WOUND is available via FREE SPIRIT Publishing and other online stores. Also by FREE SPIRIT PUBLISHING and worth the read by the younger set! ARMOND GOES TO A PARTY – this book is written to help children understand Asperger’s Syndrome or as a social story for a child on the spectrum. BUT, I really think the true audience is the parent who will love a story about hope and inclusion. Delightful book, well written and adorable illustrations. Early childhood and Young Children books by Elizabeth Verdick. From CUDDLE to BYSTANDER POWER . These books are just the right size to pop for a parent to pop in to a bag and have handy for times when you have to wait – such as a restaurant or doctors office. In fact, when I saw BEDTIME, from the TODDLER TOOLS series, I thought that it would be an excellent addition for a pediatrician’s office! Elizabeth Verdick’s catalog of books can be found at this link. Disclaimer- I was not compensated for this review except to receive a free copy of the books mentioned. I donated the books received.